Over the jubilee weekend I completed the croissant challenge and with a little improv (at one point, the dough had to go on transport on ice.) the first batch was ok. Then the next day I made an immediate second attempt, as I had the ingredients now and a little bit more of a clue what to do. Second batch was a big improvement, so I have hope for any future attempts. Scales with converters are marvellous things. I have no idea how many oz go in a lb but I can still use an American recipe because my scales are very clever. Cold is your friend. It keeps the butter firm and panic out. I can’t describe the sinking feeling of butter melting through the dough as you are rolling it out after a day and a half of work. Find a space The dough needs to be rolled out long, so find a space where you are not bumping into kitchen paraphernalia. Take your time part 1. Croissant dough is not necessarily a difficult recipe (unless you’d live in Hawaii see previous point) but it needs to rest a lot. The recipe I used had 2 overnight rests, but after some browsing and comparing recipes, (some even said too much rest in the first stage would make the croissant too bready) I gave the dough a new-parent overnight rest in the fridge (roughly 4hrs) which did not seem to affect it. Take your time part 2. The last proving stage of 2hours does need to happen. I cut this short by an hour during the first attempt. (My own fault for oversleeping epically and there was a morning schedule.) Result: dough was too dense still. Take your time part 3. Cooking time. Ovens are all different, so while the recipe said 8-10 min, during my last and most succesful batch I had the croissants in the overn for 20min. Turning down the heat from 200C to 180C to prevent burning. Worth its salt. The first batch was a bit bland so put more salt in the second batch. Obviously immediately worrying it was too much, but 2 -2.5 teaspoons was needed to enhance flavour. Preciseness perfection 1. When I say that the recipe was not too difficult, it’s because I decided not to be OCD about it. Had I let that beast out, the whole thing was a disaster and (more) panic would have ensued! Working butter into the dough, rolling and folding, you want it to be precise otherwise the chances of butter peeping through the edges increases. Rolling by hand, needs to be as equally pressured as by a machine: still working on that. Preciseness perfection 2. The croissants were not evenly shaped, I did not use a ruler, and I still have to work on getting the puffiness in the middle right. ( Currently it is collapsing, I think it’s because the butter might have seeped out of the edges). However, overall a positive experience and a new found skill I will be trying to improve. This weekend something huge is about to happen. 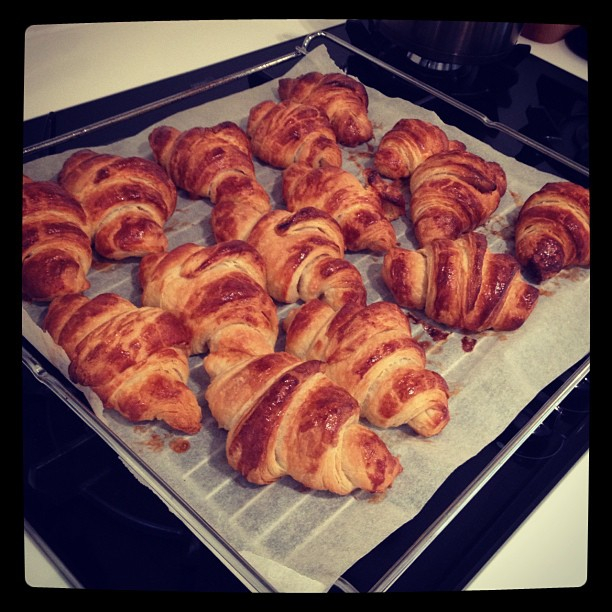 Forget the Jubilee, the four-day weekend or any rain soaked barbecues: Sunday will be croissant day. The friends, supportive as they are of course, obviously have an agenda of their own as they will get to eat the croissants. If they (the croissants, not friends) turn out alright that is… and so suddenly support group feels a little as peer pressure. Why all of a sudden the leap to play with the big girls then? I love croissants. A great croissant: a plain, no chocolate, apricot or almond paste, a great well baked, no claggy heaviness but dark brown crisp and fluffy, and importantly non-squished croissant (what’s those tongs!) can make my day. 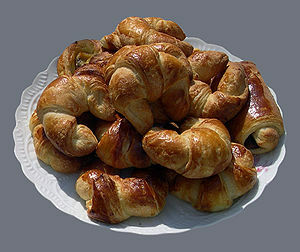 Especially in combination with a wonderful black coffee, a great croissant can make me very happy. I want to get to know my source of happiness, want to learn how much effort goes into each fold and layer. The chemistry of the croissant lies in the folding: the butter melts between the layers and creates the air between them, if done well you get lovely fluffiness. Do I expect my first attempt of one of my favourite things to go well: No not at all (Sorry hungry friends). I will just do my best and hopefully try again, and again.